Artistic and pleasurable pursuits have your heart, but disruptions in relationships keep you on your toes. This is a period of balancing freedom with responsibility, and each is an important element. Since you’re feeling a bit competitive, sports or fitness activities that challenge you to meet new goals could be fun. Just avoid high-risk situations from December 1 to 14. Visualization can make a big difference in your performance. Explosive situations in partnerships can lead to improvements during the Moon on December 7, but if your ego is wounded you could lash out and create lasting damage. If you do need to break away, it can be done with grace; and if a relationship needs a new footing, it can be created with vision and love. 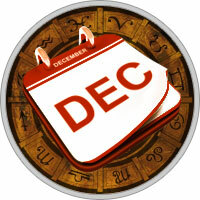 Romance fares best after December 12, although you may feel a bit reticent until you’ve established trust. Time for introspection during the Moon on December 22 safeguards your dreams while they’re taking root. Cooperation with others may not be easy, especially if everyone wants to run the show. Defining roles and staying within boundaries is challenging, but may be the only way to satisfy individual needs. Finances are up and down until December 17, when the tide can turn for the better. Keeping an open mind and making room for innovation are valuable assets in this period of change. If you’re trying to hang onto something past its time you’ll only exhaust your strength.